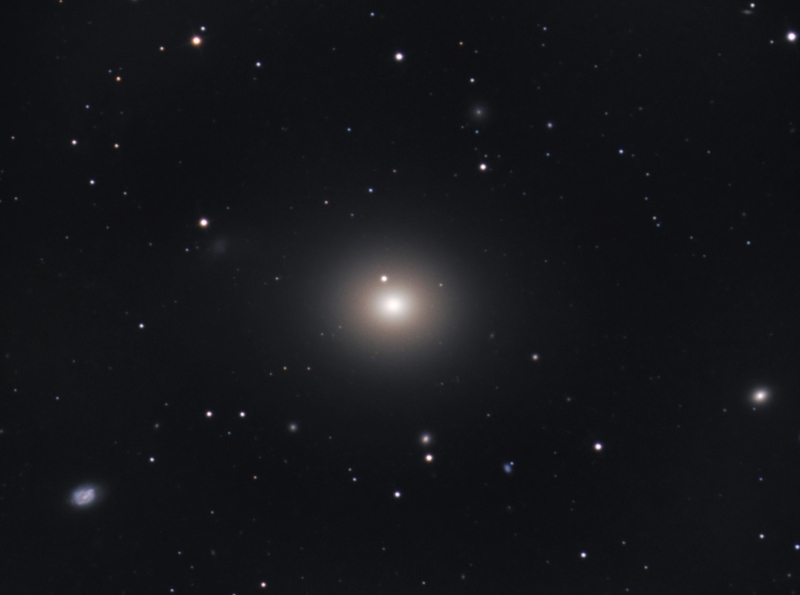 Messier 49 (M49 or NGC 4472) is an elliptical galaxy at 56 million light-years away in the constellation Virgo. Like most ellipticals, it is difficult to tease out much structure in the object itself, but this bright Messier object lies in an interesting field loaded with other galaxies of various sizes and shapes. The colorful little one at the lower left is NGC 4470 (aka NGC 4610) and shows a nice barred spiral character with a face-on view. Exposure: LRGB: L:20x10min R:10x8 min, G:9x6 min, B:10x10 min for a total of 7.2 hrs. Processing: Image acquisition using CCD Autopilot. Initial processing was done using Maxim DL with subsequent processing with Photoshop.